This joyful and reverent book was originally written for second graders to use in their Christmas program. 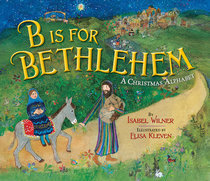 The graceful couplets follow the letters of the alphabet and tell the story of the Nativity by introducing young readers to the events, people, and places associated with the birth of Jesus. The richly textured illustrations by acclaimed artist Elisa Kleven are mixed-media collages of watercolors, cut paper, and fine lines that depict the story in a folk-art style. Originally published in 1990, the book was selected as an American Bookseller "Pick of the List" and is being reintroduced for its 25th anniversary. Isabel Wilner spent her early years in China and in the Philippines and many of her later ones in Towson, Maryland, where she was librarian of the elementary school at Towson State College. Her work with the children there resulted in her first book, "The Poetry Troupe, " an anthology of poems to read aloud. In her retirement, she volunteers as a storyteller and poetry sharer in elementary schools and day care centers. <P>Ms. Wilner divides her time between her apartment in Towson and her home in Tunkhannock, Pennsylvania.